Wireless technology is ever evolving, with increasing connections and applications that require higher bandwidth. Future networks will need more wireless capacity and reliability. The Wi-Fi Alliance, that promotes Wi-Fi technology and certifies Wi-Fi products for conformity, launches its next version of Wi-Fi ‘WiFi 6.’ As a part of this, Wi-Fi alliance has come up with the naming system that provides users with an easy-to-understand designation for the Wi-Fi technology supported by their device. The new naming system identifies Wi-Fi generations by a numerical sequence which corresponding to advancements in Wi-Fi. 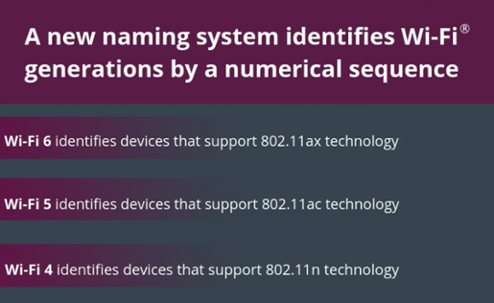 '802.11ax' will be known as "Wi-Fi 6," making it easier for the manufacturers, operators and also users to differentiate between 802.11ax, 802.11ac, and 802.11n. Each successive generation of Wi-Fi offers new and advanced features. Bointec follows the naming conventions. This will help our customers to easily understand the Wi-Fi generation supported by their device and to sort through technical features to choose the technology they want. Currently we have not released a Wi-Fi 6 (802.11ax) product, but some of the other products that will fall under the new naming conventions are as follows. Learn more about Bointec's products or contact us at tjlcontact@bointec.com for your inquiries.